The fuming is all about CreateSpace, the self-publishing platform he used, and the sheer temerity of self-publishing authors, and about Amazon having made it possible for this author to get his book published without any of the established publishing houses and sellers being involved. Thereby, he took control of his situation, and Amazon, which some people think is the Voldemort of the publishing establishment, give him an online outlet for his sales, on agreeable terms. It also has a more indirect consequence: authors who self-publish soon realize that readers and reviewers are merciless toward amateurs – amateurs, those who do not know their craft and write badly – not debut authors. You can be as raw as an onion so long as your book has been well written and, crucially, properly edited. Editing is one thing you cannot do by yourself. You’ll never spot all your mistakes and spell and grammar checks only work up to a point. Being self-published actually brings home the fact that you can’t do it by yourself. You still need editors, proof-readers and early version readers. In a traditional publishing house, this gets taken care of by others. If you self-publish, you need to take care of it yourself. In the process, I believe authors learn and get better. I know from experience that every error I found in my lovingly printed hard copies was like a nasty paper cut, never to be repeated. Is there merit in all the merde going on? This uproar is not about Kostas’ book, but about the fact that it is a self-published book that got nominated for an established industry award, an industry in which there persists the conviction that something self-published is likely to be of inferior quality. I have not read the novel – I don’t read French – but the online reviews are polarized between fawning five-star ratings and sweary one-star ratings. But if it got on the Renaudot Award long list, it must have merit. Evie Gaughan, herself a self-published author, wrote an excellent analysis of this incident in The Irish Times, and it is well worth reading. Oh là là! A self-published book has found its way onto the long list of one of the most prestigious literary prizes in France, le Prix Renaudot, setting the scene for a battle royale between booksellers, the jury and Amazon. 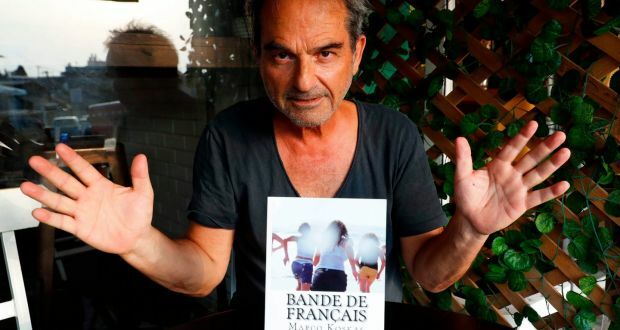 Bande de Français, a novel by French-Israeli author Marco Koskas, was included in a long list of seven essays and 17 novels competing for the Renaudot and has caused outrage amongst the booksellers of France. Like all literary prizes, the long lists result in a huge sales boost for bookshops, but as Koskas’ book was published through CreateSpace, this would require booksellers to order them from their arch-nemesis, Amazon, and they are refusing to do so. This is the most telling aspect of this latest literary storm – while booksellers and Amazon are facing a showdown over distribution, the jurors are naturally more concerned with the content of the book and its literary merit. The author is ultimately caught in the crossfire and what should be an exciting time for Koskas and his book has become all about the booksellers and what they see as an unacceptable situation. But what of the reader? Do they care who published the book and what’s more, should they care? It has raised all sorts of complicated questions for the entire industry who could either use this as an opportunity to respond to the ever-changing landscape of publishing, or simply throw their hands in the air and blame everything on Amazon. At the moment, it seems to be the latter, as Mélanie Le Saux, owner of the Neverland bookstore at Acheres in Yvelines, wrote a scathing open letter to the Prix Renaudot jury, in which she refers to Amazon as the beast at the door. Should the jury remove Koskas’ book from the list to avoid causing upset to France’s booksellers and what would that mean for the integrity of the award? According to French booksellers, the issue has more to do with Amazon than self-publishing, but it’s difficult to separate the two, as it is the number one platform for eBooks and paperbacks. Before the digital revolution of self-publishing, if an author couldn’t get a deal to publish their book, they simply packed away their manuscript and hid it in a drawer. Amazon offered a bright, shiny alternative to the gatekeepers who usually kept the gate locked and slept with the key under their pillows. Unfortunately, the erstwhile saviour of rejected books is now threatening the very place most authors would like to see their work (on the bookshelves) and also seems allergic to paying tax. The balance of power is shifting and perhaps this is the wake-up call everybody needed. More and more authors are seeing the benefit in becoming “hybrid authors”, that is to say, publishing some books traditionally and other via self-publishing platforms. And why is this? Because, while it isn’t comparing like with like, self-publishing is easier, faster and the royalties are higher, so this isn’t something that is just going to go away. Kaskos, who has several books published with traditional publishers, chose to self-publish this book after it had been rejected outright. Amazon has provided authors with that direct route to readers, who might not be able to place their novels elsewhere. Yet there is no doubt that booksellers see Amazon as posing a massive threat to the entire industry. According to the Syndicat de la Librairie Française, an umbrella group for French bookstores, Amazon doesn’t just want to become “a major player in the book market, it wants to become the market itself by eliminating its competitors, organising unfair competition, avoiding tax and replacing publishers, distributors and bookshops in one fell swoop”. It remains to be seen if Koskas’ book will make it to the shortlist and whether or not the booksellers will be forced to buy it from Amazon, or face a situation where one of the most in-demand books will not be available to buy from the bookshops. They may in fact go one step further and choose to boycott the Renaudot altogether. It seems to go against the spirit of literary awards, which one assumes is to shine a light on exceptional writing. As Koskas himself pointed out, “I’m not responsible for this situation. I’m a writer, so if I don’t publish my book I die.” The plot thickens.